I started making mayonnaise after the only soy-free brand I could find was taken off the market. We were surprised to find that my homemade mayonnaise had a much better flavor… so much better, in fact, that I would continue to make my own mayonnaise now even if I could find another soy-free commercial brand. At first I made mayonnaise with a mixer, and it was a lengthy and difficult process. Then I started making it with a stick blender, and although that simplified the process, making mayonnaise still took nearly half an hour. A few months ago I switched to making mayonnaise in my food processor. With the food processor, I can now make a batch of mayonnaise from start to finish in less than ten minutes. Start by mixing the vinegar or lemon juice with the salt, mustard, and sugar. Add the eggs. Because I have concerns about fresh eggs and salmonella in this uncooked mayonnaise, I use pasteurized powdered egg yolks that I first reconstitute in a small amount of water, following the directions on the can. I just dump all of these ingredients into the food processor and pulse it several times until everything looks well mixed. Then I start adding about a teaspoon of the oil at a time, while keeping the processor running. The most important part of making mayonnaise is to add the oil very slowly. If you add too much oil too quickly, the mixture will not emulsify and you will end up with an oily, liquidy mess instead of a creamy, smooth mayonnaise. Continue to add the oil a teaspoon at a time. With a food processor, the mixture will start to thicken and look like mayonnaise in just a couple of minutes, but don’t try to hurry the process… keep adding the oil in small amounts until all the oil has been added. 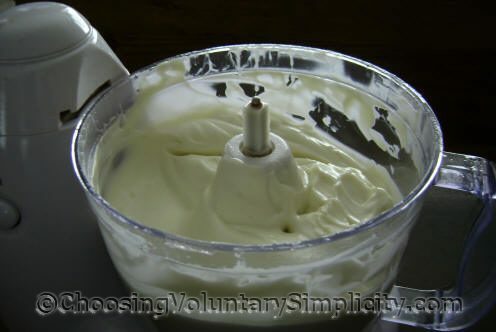 If the mayonnaise becomes too thick, and it probably will, it can be thinned out with small amounts of water, adding a bit at a time and pulsing until the desired consistency has been reached. That’s all there is to it… and you’ll have a great-tasting mayonnaise! Because this mayonnaise does not contain preservatives, it will keep in the refrigerator for about five days, so make only as much as you know you will use during that time. After all, if you run out, it will only take a few minutes to make more! This recipe can easily be halved or doubled, and the amount of vinegar or lemon juice can be adjusted to suit your taste preference. If I’m going to be using the mayonnaise immediately, sometimes I pulse in a few cloves of fresh garlic or some other herb. Sometimes I use a spicy brown mustard and honey instead of sugar. It’s a very flexible recipe! Thanks so much for the recipe!! I like to have a years supply of food on hand. Mayo from the store doesn’t last very long on the shelf. This will be a great way to have fresh yummy mayo available whenever we need it. THANK YOU!!! I have been craving chicken salad like mad lately, but couldn’t find soy-free mayo anywhere. I just made some of my own mayo using your recipe, and it is fantastic! (I used pasteurized liquid egg whites and safflower oil.) The mayo really is so much tastier than store-bought. I then proceeded to make some of the most delicious chicken salad ever. You have no idea how grateful I am!! Thank you so much for sharing this. PLEASE keep in your mind that CANOLA, not just some, about 98% on the planet is now MONSANTO ROUND UP READY Genetically Modified Canola. Avoiding soy just to end up jumping into the GMO Caola fire is not a great change. Canola is NOT a great oil, rancid almost from the time it is created. Olive oil, even peanut oil or sesame oil (interesing smell and flavor) are much better subs. Thank you for the recipe, I have been frustrated chasing edible food, and mayo I love. I must try this one. Thanks so much for posting this recipe. I’ve bookmarked it. I plan to use it very soon. I recently stopped using canola and soy and was at my wits end trying to find a mayo that was free of both. Nice to find your site, and glad to see I’m not the only one that makes homemade Mayonnaise. As you say, it’s impossible to find anything that isn’t contaminated with GMO Soy. Thank you so much for sharing this recipe! I was recently diagnosed as not only being allergic to soy, but also to peanuts, dairy, shellfish, yeast, and beef. I’ve been looking everywhere for an alternative to store-bought mayonnaise that does NOT use vinegar (because it is a derivative of yeast). Did you use actual mustard, or mustard powder in your recipe? All commercial mustard I have found contain vinegar as well, so I may have to try this with powder instead. Samantha, I use the dry mustard or mustard powder in making this mayonnaise. Be careful with commercial mustards… most of them also have some form of hidden soy. Thanks so much for posting! My daughter has a soy allergy and I have been craving mayo on a sandwich (I’m still nursing her so I have been off of soy for about 2 months.). I can’t wait to try your recipe…and I didn’t know about hidden soy in mustard! I have been eating French’s and it doesn’t say anything about it on the label, but I will have to check again! Thanks! I really appreciate the recipe. Remember to avoid distilled vinegar because it is made entirely from GMO corn. Bragg organic apple cider vinegar or Santa Cruz organic lemon juice are the best options. Also, refined oils like sunflower, safflower or canola oils contain hidden citric acid (product of the fermentation of GMO corn by the mold Aspergillus Niger). As someone that is allergic to corn and soy, I react to all the oils on the market except extra virgin olive oil in glass bottles or virgin organic coconut oil. It took a lot of research before I found the source of my allergic reactions: citric acid is used as a “degummer” in the processing of refined oils. Since it is only used as a “manufacturing aid”, the FDA doesn’t require the companies to list it on the label. Is it possible to make this mayo or mayo in general without the use of egg yolks? My daughter is allergic to soy and egg yolk, but she can eat the white part of the egg. Thanks in advance for your help. Ivonne, I have used dehydrated egg whites in this recipe and they work fine. I am in the process of trying to eliminate ALL soy from my diet. What I want to know is if you use chicken eggs which are fed on soy based feed do you not get the soy isoflavones concentrated in the egg yolk? I notice that now ther are farmers selling organic eggs from birds fed on coconut meal with no soy added. I didn’t know about the hidden soy in mustard. I’m allergic to soy and wheat and a multitude of other foods and preservatives. A while back I ate some mustard and got really bad intestinal cramps like I get when I eat soy. Now I know why! I’m definitely going to try this recipe for mayonnaise, cause I can’t find soy-free mayonnaise anywhere. Thanks! We started making our own mayonaise recently, not due to soy, but due to price. The store wanted nearly $8 for a jar just over a quart. I can buy a gallon of oil for less. The recipe we use is very similar to yours, minus the mustard, and tastes every bit as good as what we can buy in the srore. I doubt I will ever buy mayo again. Another article I read said to “temper” it with a table spoon of whey drained out of plain yogurt, by stiring it into the mayo and leaving it on the counter for 6 hours before refrigerating it, and that this will allow it to keep for a month or two. Any thoughts on this? Thank you for the recipe. I have read all the comments, and I feel better to find that others are also allergic to soy. In response to the comment about eggs and chicken feed, I was getting sick from eggs. I tried eggs from local chickens who were not fed commercial feed, and–no problems! I now eat local fresh eggs, not commercial eggs. So yes, I think what the chickens are fed does get into the eggs. I make my own greek yogurt. I reserve the whey for other uses. I fold in 1 tablespoon of whey to the mayo and then let it sit on the counter for 6 hours. this ferments the mayo so it will keep in the fridge for 2 months! it works great! Thank you – was in middle of making an artichoke dip -realized out of mayo-husband ran to the store only to tell me all the ones on the shelf had soy! So glad we found you -mayo turned out excellent and if I’d known mayo was this simple to make -would have done years ago! I didn’t like the idea of using raw eggs either and didn’t have dried eggs so I substituted hard boiled eggs (entire egg, yolk and whites) and it turned out great. Wow thank you so much for this easy recipe. The flavor is amazing and I continue to keep making this over and over! So glad to be able to make it homemade without gmo and soy or HFCS etc in it! Trying this recipe this weekend, sourced by my wife. My fave mayo just decided to change their non-soy mayo to include soy. I’m trying this before running to another brand.